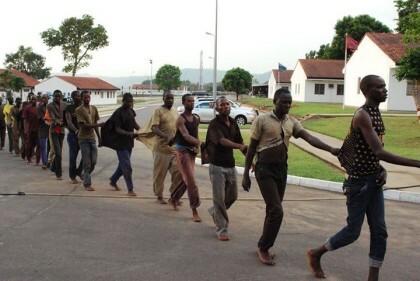 117 Guards Brigade of the Nigerian Army Keffi yesterday paraded 36 armed herdsmen who were intercepted by troops of the Guards Battalion in Keffi along the Keffi-Abuja highway road on Sunday. Another set of 56 herdsmen were arrested at the Dantata check point along Kuje and Abuja airport axis. The 36 herdsmen were arrested by troops at the Keffi check point at the late hours of Sunday around 4pm in a Truck and a Toyota Camry Salon car, the spokesman of the brigade, Captain Bashir Jajira, told newsmen. Capt. Hajia during interrogation by troops at the check point, they said they were going to Nasarawa LGA of Nasarawa State. Jajira said after a thorough check of the vehicles, the troops discovered one pump action gun, 19 cartridges of dane guns, 118 cartridges of ammo, 28 cutlasses, three jack-knives, 14 sticks, seven torches, assorted charms and hard drugs. The other group of 56 herdsmen the Capt. said were arrested at the Dantata check point Kuje along the airport in the Gwagwalada area of the Federal Capital Territory (FCT). Jajira said 26 cartridge dane guns and 49 cutlasses and knives were recovered from the suspects. Jajira also added that all the suspects claimed to be on the lookout for cattle rustlers who stole their cows. He lastly said the suspects would be handed over to the police for proper and further investigation. 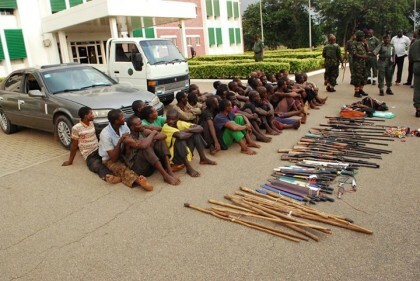 Brigadier General Musa Yusuf, Commander Guards Brigade, told journalists that the arrests showed the determination of the brigade to rid the Federal Capital Territory of any criminal activity.